First, I would like to say this table is inspired by NiteWalker’s drill press table, which has been posted on here a couple of times, and I borrowed several ideas off that design. Also, I would like to say thank you to NiteWalker for taking the time to answer some questions I had about the design before I began building mine. The table is two layers of 1/2” baltic birch plywood that have been glued together. This is plenty sturdy, and is less “chunky” on my little 10” drill press than the designs that use two layers of 3/4” plywood. Dimensions are 14”x22” with 3/4” radius on the corners, and a 1-1/2” deep notch for the column. The fence has a matching notch to help minimize the depth loss when using the fence. I started by cutting a 14”x22” blank from the 1/2” BB plywood. Then I cut out a sacrificial insert from the same 1/2” material, 4” square, with 3/8” radius corners. I first cut out the insert, then made a template around that using scrap plywood and pocket screws, to use to make the opening for the insert in the table. I also went ahead and batched out some extra inserts at this time so I don’t have to do it later. Borrowing NiteWalker’s idea, I used a 3/4” pattern bit inside the template I made, to route out the opening table (top-layer only, before glue-up). This left a square opening with perfect 3/8” radius corners to accept my insert. With a little sanding, my insert fit perfectly. Note that the square insert is rotated 45 degrees to give more of a diamond shape. Due to the way I decided to mount my table (1/4” connector bolts from the top), I needed to do it this way in order to create clearance for the mounting bolts. This is because the original metal table on my drill press is only about 7-1/2” square. You’ll see what I mean from the photos. The insert is also offset so that I can rotate it four times before having to replace it. At this point, I rough cut a slightly oversize 14”x22” blank for the bottom, so I could join it to the top with glue, and then use my router and a flush-trim bit to clean it up. Now to avoid getting glue into the area where the insert would sit, I put masking tape on the bottom layer where the insert would sit, then temporarily joined the top and bottom (at this point I drilled and inserted a few dowels for repeatable alignment), and then used a razor blade to cut through the masking tape while tracing the outline of the insert opening. Then I separated the top/bottom layers and removed the excess tape on the ‘outside’ of the razor cut, leaving masking tape only in the insert area. Then I re-joined the top and bottom, but with glue this time. Once joined I removed the tape from the insert area which revealed a perfectly clean bottom for the insert to sit in. No scraping required. Once the top and bottom were joined, I cut 3/4”x3/8” dados on my table saw to accept the T-track I had on hand. Then before actually installing the T-track, I laminated both sides of the table with some leftover Formica / plastic laminate that I bought off craigslist. I laminated over the top of the dados and over the insert opening, and then went back later and routed out those areas with a Whiteside SC28C “small pilot for dado” flush trim bit. I made small counterbores on the bottom of the table to accept 8-32 T-nuts so that I could install the T-track with 8-32 machine screws and never have to worry about the tracks pulling out. The fence is made of 3/4” scrap MDF I had on hand, with the wear surfaces (bottom and face) laminated with the same formica used for the table. I did chamfer all the edges, and made a little relief notch on the bottom of the fence face to allow for sawdust and shavings. I used 8-32 machine screws to attach the fence, this time with regular washer/nut on back of the fence. Final step was to install some leveling screws in the insert area (since without this, the insert sits below the table top by an amount equal to the thickness of the plastic laminate). Also, once I got everything lined up, I drilled a 1/4” hole all the way through the table. This serves two purposes: (1) makes it a snap to re-align the table when I have to take it off and put it back on, and (2) I can insert my drill chuck [edit: key] in this hole from underneath the table in order to pop out the insert when I need to rotate or replace it. This way I didn’t need to cut any notches in the insert, or in my table. Well I think that about covers it, haha. :) Thanks for looking, and thanks again to NiteWalker for the ideas and inspiration that surely made this project a lot easier for me. Looks great. On a side note, how do you like the 10” wen? Fantastic additon to your drill press!!! Nice work. 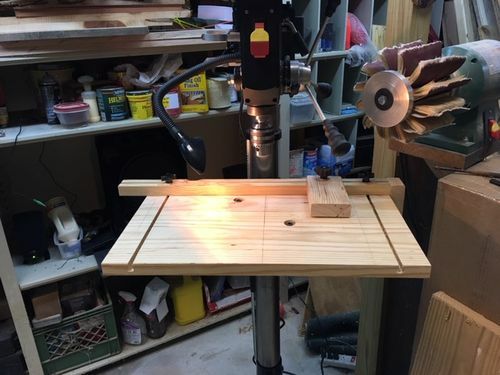 Devereauxrf, someone asked me the same question when I posted my drill press stand project a few months back, and I wrote a lengthy reply there. Check out post #14 on that previous project post, here: https://www.lumberjocks.com/projects/398625 (I don’t see how to link to a specific post here on LJ…). Basically then 10” WEN is okay for the money. However, I had QC issues with mine and had to go through multiple returns before I got one I could use. If I could have paid more for a better 10” drill press I would have, but it seems all these come from the same place and are pretty much built the same anyway. It’s fine for a hobbyist like me. Here’s a look at how I made the template to route out the opening for the sacrificial insert. I can’t figure out how to embed the images which are hosted on Imgur, if anyone knows how to do this let me know..
Haha, thanks Wayne. Yes, indeed your Woodpeckers Corner Jig kit made the 3/4” and 3/8” radii a snap! And you’ve got that right about cost—your corner jig kit literally cost 3x what my actual drill press cost! :-) Thanks again for letting me borrow it. Very nice table. Does the handle for raising/lowering the table clear it. Mine doesn’t so I added a crude extension shaft to the handle as a temporary measure. I’m looking for a final solution. Does the handle for raising/lowering the table clear it. If I can make some kind of socket fit, then I’ll probably just use that with a ratchet and not worry about anything more complex. If anyone has better ideas then I’m all ears! I used a 1/2 inch gas pipe as a handle extension which has worked well. This was for a Delta benchtop press. It fit snuggly and was easily tapped for a set screw. metolius, great idea! I’ve added that to my list of options.